If you regularly ride a bicycle, but the cold weather outside stops you from being able to ride, turning your regular bicycle into a stationary bicycle is an easy way to find two uses for the same equipment. All you need is a special stand that converts your bicycle into a stationary bike trainer. You can use this until the weather is good enough for riding outdoors again. 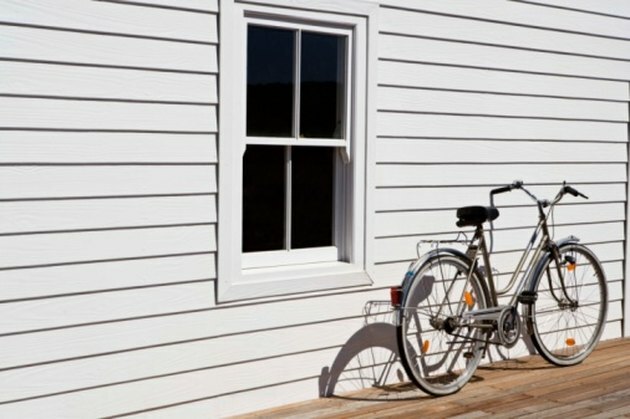 Find a spot in your home where you have enough space for your bike as well as enough space to mount the bike. Choose a level spot, on a non-carpeted surface, if possible. Lay out the bicycle stand parts exactly as you would like them be placed—some stands are two pieces that must each be fitted to the bicycle while others are one piece. Putting them in the right spot will ensure you have space as well as enhance the speed of setting up. Situate the back end of the bicycle on the stand first. You should clamp the back wheel in as firmly as possible. There will be some wiggle room until the front wheel is on a stand. Place the front wheel on the stand. Tightly secure this portion. Re-tighten the back wheel of the stand again, ensuring it is solidly in place, yet not so tight that it will cause rubbing or failure of the bearings in the bicycle. Take a few steps back from the bike to make sure that the bicycle is evenly mounted. If you notice a dip in the front or back wheels, reposition the bicycle to ensure it's even. Wiggle the bicycle from side to side, ensuring that it is tip-proof. When you are riding the bike at full speed, it can wobble from side to side: ensure the bike allows enough movement, yet is stable enough to support you throughout your ride. There are two types of stationary bike stands: a trainer, which clamps the back wheel of the bicycle, yet the front wheel stays on and is able to move, or a roller bike stand which elevates the bike, allowing both wheels to spin. If you tend to sweat a lot during a strenuous bike ride, put towels down around the bike. Otherwise, you may have sweat puddles staining the floor.